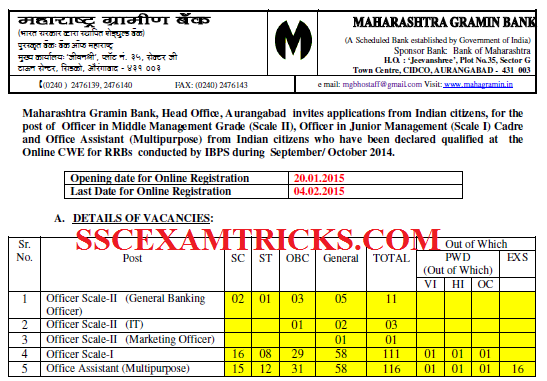 Maharashta Gramin Bank (MGB) had released latest notification against for recruitment of 242 posts of Officer Scale I, II and Office Assistant (Multipurpose) in the various departments on the basis of performance of IBPS CWE III held in the month of September/October 2014. ONLINE applications are invited for 242 vacant posts of Officer Scale I, II & III and Office Assistants on the official website from 20TH January to 04th February 2015. · All the selected candidates must reach the venue of Interview at least 20-30 minutes before the time mentioned on the interview letter of the candidate. · Selected candidates are required to bring computer generated online application, result print, original documents (10th, 12th, UC DMC, Cast certificate –If applicable etc.) and one set of self-attested of all the documents to the venue of interview. · 10th Certificate is used for Age Proof. Candidate must bring at least one Address proof i.e. PAN Card, Ration Card, Aadhar Card, Voter card or Driving License.